Asie is Yird's lairgest an maist populous continent, locatit primarily in the Eastren an Northren Hemispheres. It shares the continental laundmass o Eurasie wi the continent o Europe an the continental laundmass o Afro-Eurasie wi baith Europe an Africae. Asie covers an aurie o 44,579,000 square kilometres (17,212,000 sq mi), aboot 30% o Yird's tot laund aurie an 8.7% o the Yird's tot surface aurie. The continent, that haes lang been hame tae the majority o the human population, wis the steid o mony o the first ceevilisations. Asie is notable for nae anly its oweraw lairge size an population, but an aa dense an lairge settlements, as weel as vast barely populatit regions. Its 4.5 billion fowk constitute aboot 60% o the warld's population. In general terms, Asie is boondit on the east bi the Paceefic Ocean, on the sooth bi the Indie Ocean an on the north bi the Arctic Ocean. The wastren boondar wi Europe is a historical an cultural construct, as thare is na clear pheesical an geografical separation atween them. The maist commonly acceptit boondaries place Asie tae the east o the Suez Canal, the Ural River, an the Ural Moontains, an sooth o the Caucasus Moontains an the Caspian an Black Seas. Cheenae an Indie alternatit in bein the lairgest economies in the warld frae 1 tae 1800 CE. Cheenae wis a major economic pouer an attractit mony tae the east, and for many the legendary wealth and prosperity of the ancient culture of India personified Asia, attractin European commerce, exploration an colonialism. The accidental diskivery o Americae bi Columbus in sairch for Indie demonstrates this deep fascination. The Silk Road becam the main East-Wast treddin route in the Asie hinterlands while the Straits o Malacca stuid as a major sea route. Asie haes exhibited economic dynamism (pairteecularly East Asie) as weel as robust population growthe in the 20t century, but oweraw population growthe haes syne fawen. 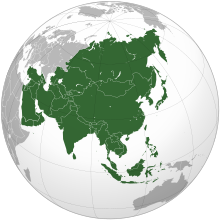 Asie wis the birthplace o maist o the warld's mainstream releegions includin Christianity, Islam, Judaism, Hinduism, Buddhism, Confucianism, Taoism (or Daoism), Jainism, Sikhism, Zoroastranism, as weel as mony ither releegions. Gien its size an diversity, the concept o Asie—a name datin back tae clessical antiquity—mey actually hae mair tae dae wi human geografie nor pheesical geografie. Asie varies greatly athort an within its regions wi regaird tae ethnic groups, culturs, environments, economics, historical ties an govrenment seestems. It an aa haes a mix o mony different climates rangin frae the equatorial sooth via the het desert in the Middle East, temperate auries in the east an the continental centre tae vast subarctic an polar auries in Siberie. ↑ National Geographic Atlas of the World (7th ed.). Washington, DC: National Geographic. 1999. ISBN 978-0-7922-7528-2. "Europe" (pp. 68–9); "Asia" (pp. 90–1): "A commonly accepted division between Asia and Europe is formed by the Ural Mountains, Ural River, Caspian Sea, Caucasus Mountains, and the Black Sea with its outlets, the Bosporus and Dardanelles." ↑ "Professor M.D. Nalapat. Ensuring China's "Peaceful Rise". Accessed January 22, 2016." Archived frae the oreeginal on 10 January 2010. ↑ "Dahlman, Carl J; Aubert, Jean-Eric. China and the Knowledge Economy: Seizing the 21st Century. WBI Development Studies. World Bank Publications. Accessed January 22, 2016". Eric.ed.gov. Archived frae the oreeginal on 4 March 2008. Retrieved 9 November 2017. ↑ "The Real Great Leap Forward. The Economist. Sept 30, 2004". The Economist. Archived frae the oreeginal on 27 December 2016. ↑  Archived 20 November 2008 at the Wayback Machine. ↑ "Like herrings in a barrel". The Economist. The Economist online, The Economist Group (Millennium issue: Population). 23 December 1999. Archived frae the oreeginal on 4 January 2010. .
↑ "Asia". AccessScience. McGraw-Hill. Archived frae the oreeginal on 27 November 2011. Retrieved 26 July 2011.